Data from an ethnobotanical study were analyzed to see if they were in agreement with the biochemical basis of the apparency hypothesis based on an analysis of a pharmacopeia in a rural community adjacent to the Araripe National Forest (Floresta Nacional do Araripe - FLONA) in northeastern Brazil. The apparency hypothesis considers two groups of plants, apparent and non-apparent, that are characterized by conspicuity for herbivores (humans) and their chemical defenses. This study involved 153 interviewees and used semi-structured interviews. The plants were grouped by habit and lignification to evaluate the behavior of these categories in terms of ethnospecies richness, use value and practical and commercial importance. Information about sites for collecting medicinal plants was also obtained. The salience of the ethnospecies was calculated. G-tests were used to test for differences in ethnospecies richness among collection sites and the Kruskal-Wallis test to identify differences in the use values of plants depending on habit and lignifications (e.g. plants were classes as woody or non-woody, the first group comprising trees, shrubs, and lignified climbers (vines) and the latter group comprising herbs and non-lignified climbers). Spearman’s correlation test was performed to relate salience to use value and these two factors with the commercial value of the plants. A total of 222 medicinal plants were cited. Herbaceous and woody plants exhibited the highest ethnospecies richness, the non-woody and herbaceous plants had the most practical value (current use), and anthropogenic areas were the main sources of woody and non-woody medicinal plants; herbs and trees were equally versatile in treating diseases and did not differ with regard to use value. Trees were highlighted as the most commercially important growth habit. From the perspective of its biochemical fundamentals, the apparency hypothesis does not have predictive potential to explain the use value and commercial value of medicinal plants. In other hand, the herbaceous habit showed the highest ethnospecies richness in the community pharmacopeia, which is an expected prediction, corroborating the apparency hypothesis. When applied from the ethnobotanical perspective, the apparency hypothesis, which was developed by ecologists in the 1970s (see [1, 2]), treats plants as resources and humans as herbivores or consumers that require these resources [3–6]. This hypothesis considers two groups of plants, apparent and non-apparent, that are characterized by their conspicuity (apparency) for herbivores. Non-apparent plants are difficult for herbivores to find because the plants are not predictably distributed in space and time; this group includes herbs, short-cycle plants, and those at early stages of plant succession [3, 5]. Apparent plants are perennial, woody plants that usually dominate forest ecosystems and are comparatively more predictable in space and time, thus being easily detected by herbivores [3, 5]. In general, one could characterize non-woody plants (herbs and non-woody climbers) as non-apparent and woody ones (trees, shrubs and vines) as apparent. From the biochemical perspective of antiherbivore defense, non-apparent plants are characterized by producing qualitative defenses, such as highly bioactive, low molecular weight compounds at low concentrations (e.g., alkaloids and terpenoids), whereas apparent plants are characterized by producing digestion-reducing quantitative defenses (tannins and lignins) . Apparent and non-apparent are relative terms and must be applied according to the scenario to be investigated. For example, according to one reviewer of this paper “pioneer vegetation consisting of herbs (here called non-apparent plants) is apparent immediately after human disturbance (during early successional stages)”. The apparency hypothesis relates to plant succession in that plants characterized as non-apparent dominate the early stages of plant succession, whereas plants characterized as apparent dominate forests in later successional stages . Studies conducted by different authors have shown that secondary vegetation is the main source of medicinal plants for tropical pharmacopoeias [7–9], highlighting the importance of herbs and exotic plants in some cases [10–12]. Exotic plants are related to plant succession because they usually establish themselves in disturbed habitats (secondary vegetation or cultivated areas) and most often exhibit an herbaceous habit . Voeks  observed the importance of secondary vegetation, herbaceous habit and/or exotic species in the pharmacopoeias of different sites and concluded that tropical pharmacopoeias are primarily a product of disturbed sites that are covered by secondary vegetation. Indices that quantify the relative value of plant species for people are required for testing the apparency hypothesis. The use value, initially presented by Phillips and Gentry , and relative importance, proposed by Bennett and Prance , are among the indices usually used for this purpose. Both of these indices are characterized by quantifying people’s knowledge of plants, but neither indicates whether the plants are actually being used , which limits the interpretation of their results beyond the cognitive domain. This difference between knowledge of the potential and actual use of particular plants [15, 16] indicates that species with high use values do not necessarily have high practical values (current use). Few studies have sought to ascertain whether medicinal plants belonging to secondary vegetation are actually used by the people who cite them . According to the apparency hypothesis, secondary vegetation zones would be important sources of medicinal plants containing highly bioactive compounds [6, 9, 11, 17]; therefore, one would expect these plants to be culturally important (high use value), widely used by local populations (high practical value)  and highlighted in the local market. In this paper, the local pharmacopeia from a community adjacent to the Araripe National Forest (Floresta Nacional de Araripe - FLONA-Araripe) in northeastern Brazil is analyzed using habit and lignification as two means of grouping plants. The aim is to discuss the apparency hypothesis and answer the following questions: (1) Does medicinal plant richness vary between habits and between woody and non-woody plants? (2) Does contribution in terms of medicinal plant richness vary among collection sites? (3) Do use value and commercial and practical importance varies between medicinal plant habits and between woody and non-woody plants? Using the biochemical fundamentals of the apparency hypothesis, it would be expected that (1) there is a higher richness of non-woody and herbaceous medicinal species as well as (2) a higher contribution of medicinal plants from anthropogenic zones. It would also be expected that (3) non-woody and herbaceous species stand out in cognitive, practical, and commercial importance metrics. The Araripe National Forest or FLONA-Araripe was established in 1946 and currently encompasses an area of 38,262.33 hectares. Most of this area is above the ‘Chapada do Araripe’ [Araripe Plateau], a formation that reaches 900 m in altitude, where the annual rainfall ranges between 671 and 2,291 mm and the average temperature is 23°C . Most of the vegetation within this conservation unit is ‘Cerrado’ [wooded savannah] (48.53%), followed by ‘Cerradão’ [densely wooded savannah] (27.49%), rainforest (22.47%), and ‘Carrasco’ [xerophytic shrubby vegetation] (1.51%) . The study was conducted in the rural community of Horizonte (07°29′36.9″ S, 39°22′06.02″ W) adjacent to FLONA-Araripe, located in the municipality of Jardim, Cariri region, Ceará State in northeastern Brazil. Horizonte has a registered population of 1,120 inhabitants (based on census information obtained by the community’s health workers). Currently, there is a health-care center in Horizonte to which the population has access through consultations every Monday, when a doctor evaluates patients and provides some pharmaceutical drugs. The residents primarily conduct subsistence agriculture. The crops typically grown include beans, cassava, and maize; only occasionally, namely when harvests are abundant, is the surplus sold. Cattle-raising activity does not generate high revenues within the region because it is conducted in the form of a small-scale production system with very low zootechnical indices . The extraction of non-timber forest products is a major source of income for the area, with approximately 60% of the population over 18 claiming to do so. Resources are collected from within the FLONA and also, to a lesser extent, from private properties of the Horizonte residents. Among the species collected, ‘pequi’ (Caryocar coriaceum Wittm.) and the ‘fava d’anta’ tree (Dimorphandra gardneriana Tul.) stand out in terms of profit. The objectives of the project, along with the methodological procedures employed, were previously presented and discussed with the members of the community studied here, who were then asked to agree to participate and to sign a Free and Transparent Consent form (TCLE). The Biodiversity Authorization and Information System (Sistema de Autorização e Informação em Biodiversidade - SISBIO) granted authorization for the present scientific activities (authorization number 27440-1), and the research ethics committee (Conselho de Ética em Pesquisa - Plataforma Brasil) provided authorization number 251.749 with CAAE 02845312.0.0000.5207 for developing this study. Semi-structured interviews were conducted in a intensive fieldwork between March and May 2011 to collect information on medicinal plants. A total of 153 people over 18 years of age were interviewed after being randomly selected (using random sampling without replacement) from a total of 462 people in the community (according to the Department of Health census). Of the 153 interviews, 93 were with women (18 to 86 years old) and 60 were with men (18 to 80 years old). The time and place of each interview was scheduled according to each interviewee’s availability . Data were checked and supplemented in the years 2012 and 2013. The first phase of each interview was to develop a free list of the medicinal plants known to the informants and use complementary techniques, such as rereading and asking related questions (non-specifically induced) on the topic, to enrich the lists [17, 19]. Once the list was completed, the interviewee was asked to mention other names that he or she knew for each of the plants previously mentioned as well as collection sites, parts used, therapeutic indications, whether the plants had any commercial value, and which parts were intended to be sold. Furthermore, the respondent was asked to identify the medicinal plants that he or she had used within the past month to obtain information on the actual use and thus the practical value of the plants; finally, the interviewee was asked to identify a resident who was knowledgeable of medicinal plants within their community. The number of plants mentioned in the free lists was used as a quantitative criterion for choosing knowledgeable locals . By combining the information in the free lists with the names of locals identified in the interviews as being knowledgeable of medicinal plants, it was possible to obtain a list of people (within the group of those randomly selected) who were best suited to participate in the study as local experts on medicinal plants. Five people were chosen as local experts: two men (63 and 48 years old) and three women (61, 44, and 31 years old), and they led individual guided tours to collect the medicinal plants mentioned in the interviews that occur within the region. A botanical sample was associated with a common name selected based on consensus among the locals experts. During the botanical collections, the habits of the plants were identified according to the parameters proposed by Begon et al. and adapted to the local vegetation according to Costa and Araújo . Thus, woody perennials that usually had only one stem or that consistently branched at least 50 cm above the ground were classified as trees, woody perennials that were smaller and exhibited abundant branching or branches consistently below 50 cm were classified as shrubs, non-lignified plants or those only lignified at the base of the stem were classified as herbs, and woody or non-woody plants that used the structure of other plants for support were classified as climbers. Next, the plants were classes as woody or non-woody, the first group comprising trees, shrubs, and lignified climbers (vines) and the latter group comprising herbs and non-lignified climbers. In addition, the plants were also grouped according to their origin: plants that originated from outside of South America were considered to be exotic plants, and those from South America were considered natives. The botanical collections were conducted during May and June 2011 and supplemented with collections from our team (Laboratory of Applied and Theoretical Ethnobiology) between the years 2012 and 2013. All the specimens were identified (according to APG [Angiosperm Phylogeny Group] III) and deposited at the Dárdano de Andrade and Lima Herbarium (Herbário Caririense Dárdano de Andrade e Lima - HCDAL) of the Regional University of Cariri (Universidade Regional do Cariri – URCA) in the city of Crato, Ceará. The voucher numbers run from HCDAL 6558 to 6701 and from 8104 to 8110. Duplicates were deposited at the Professor Vasconcelos Sobrinho herbarium (PEUFR) of the Federal Rural University of Pernambuco (Universidade Federal Rural de Pernambuco- UFRPE), Recife, Pernambuco. The plants were grouped by habit and lignification to test the predictions derived from the apparency hypothesis for the various aspects of the pharmacopeia analyzed. This study used the local classification of the plants, defining as an ethnospecies each taxonomic entity considered by the interviewees. Regarding the collection sites, an ethnospecies was considered to originate from another region if 75% or more of the 153 interviewees cited it in any of the following categories: commercially traded, brought from the ‘Sertão’ (Caatinga vegetation, tropical dry forest of Northeastern Brazil surrounding the ‘Chapada do Araripe’) or brought from the ‘Cariri’ (low areas down the ‘Chapada’). The collection sites in the FLONA region were grouped into two major types: anthropogenic areas (backyards, farms, swiddens, roadsides, paddocks, etc.) and native vegetation (vegetation present around the community on private land and vegetation from the FLONA). Each ethnospecies received a certain percentage of citations for these two types of collection sites. This percentage was used to analyze the ethnospecies richness per collection site type, determined as follows: ethnospecies with two or more informants and 75% or more citations for the site, ethnospecies with two or more informants and less than 75% citations for the site, and those with a single informant. The native vegetation was later separated into the areas outside and within the FLONA to further understand the conservation unit's role as a collection site for medicinal plants. The plants mentioned as being used during the month preceding the interview (recently used) were analyzed to obtain information about the plants’ practical importance in relation to habit and lignification. The use value (treated here as theoretical knowledge) was calculated according to the modified version proposed by Rossato et al. , in which VU = ∑Ui/n, where Ui = the number of uses mentioned by each informant for a given species and n = the total number of informants. Only the principal use for which is employed each ethnospecies is reported within this manuscript, that is, the use that received more citations from the interviewers. The commercial value was expressed as the percentage of citations affirming sale inside and/or outside of the village. The plants considered to be commercially important were those for which more than 75% of the total interviewees stated that the plant is sold (plants with only one citation were excluded). Using Anthropac 4.0 software , the salience of the ethnospecies mentioned in the free lists of medicinal plants was calculated. Two software programs were used for statistical analyses. BioEstat 5.0 for Windows  was used to conduct the G-test to test for differences in ethnospecies proportion among collection sites and the Kruskal-Wallis test to identify differences in the use values of the plants depending on habit and lignifications. Using SPSS 17.0, Spearman’s correlation test was performed to relate salience to use value and these two factors to the commercial value of the plants. A total of 222 ethnospecies were mentioned in the free lists. Of the 222 ethnospecies, 44 were considered to come from other regions, and of the 178 ethnospecies collected from the FLONA region, 62 were herbs (36.9%), 46 were trees (27.4%), 46 were shrubs (27.4%), 13 were climbers (7.7%), and there was one parasite (0.6%) (Table 1). Ten plants were neither collected nor classified according to their habit due to difficulty in finding them in the forest or to no longer being found in backyards of the community; these plants had low numbers of citations, between one and five at the most. The herbaceous habit showed the highest ethnospecies richness in the community pharmacopeia, which is an expected result, corroborating the apparency hypothesis from the perspective of biochemical fundamentals. Tocoyena formosa (Cham. & Schltdl.) K.Schum. Talisia escuelenta A. St.-Hil.) Radlk. n.c = Plants not collected or not available for collection throughout the investigation period. Identified by local literature and/or material deposited in the herbaria. In grouping the plants as woody and non-woody, we obtained 71 non-woody (42.3%) and 97 woody plants (57.7%), the latter group having the most ethnospecies, which is not in accordance with the expected results. Thus, it is clear that the type of classification used to characterize the plants defines whether the findings corroborate the predictions of the hypothesis. Because lignification is an attribute that defines apparent and non-apparent plants [3, 4], the classification of plants as woody and non-woody is more suited for the apparency hypothesis; furthermore, it is a dichotomous grouping with two mutually exclusive groups. Despite this, the two classification types clearly define the groups that represent non-apparent plants (herbs and non-woody) and allow testing of the predictions made in the present study. The dominance of herbaceous plants in terms of medicinal species richness has also been reported in pharmacopoeias from other Brazilian ecosystems, such as the Caatinga [semi-arid vegetation]  and Atlantic Forest , and also in other locations such as Southern Mexico . In the study by Albuquerque et al. , woody (trees, shrubs, and sub-shrubs) and non-woody (herbaceous) plants totaled 56.6% and 43.4% of medicinal plants, respectively, proportions similar to those found in the present study, showing that woody plants exhibited the higher medicinal species richness. In contrast, in the study by Voeks , using either of the two types of grouping proposed in the present study, the prediction of dominance by non-woody (herbaceous) plants based on the biochemical fundamentals of the apparency hypothesis was corroborated. In that study, woody (trees and shrubs) and non-woody plants (herbs and epiphytes) totaled 35% and 56% of the medicinal plants, respectively (lianas, the remaining 9%, were not included because they are both woody and non-woody). This result indicates that non-woody medicinal plants, specifically the herbaceous ones, dominate the pharmacopeia in the Brazilian Atlantic Forest. A total of 64 (38.8%) exotic and 101 (61.2%) native ethnospecies were reported among the medicinal plants collected within the FLONA region (the origin could not be determined for three ethnospecies due to taxonomic difficulties). The exotic plants were divided into 34 herbs (53.1%), 14 shrubs (21.9%), 12 trees (18.7%), and four climbers (6.3%). When the exotic plants were excluded from the analysis of the native pharmacopoeia, 34 trees (33.7%), 32 shrubs (31.7%), 25 herbs (24.8%), nine climbers (8.9%), and one parasite (0.9%) were recorded, indicating that the dominance of herbaceous plants in this pharmacopeia is an effect of the exotic medicinal flora (Figure 1). With the removal of the exotic plants, the difference between the percentages of woody and non-woody plants in the pharmacopoeia increased, resulting in 30 non-woody (29.7%) and 71 woody species (70.3%). In the case of the native pharmacopoeia, the woody plants (mostly of arboreal habit) dominated, a finding that was also reported for the Caatinga  and does not match the predictions made based on the apparency hypothesis from the perspective of biochemical fundamentals. Thus, the influx of medicinal species from other continents than South America has an effect on the proportion of habits of the plants in the local pharmacopeia and, therefore, on interpreting this pharmacopoeia from the perspective of the apparency hypothesis. 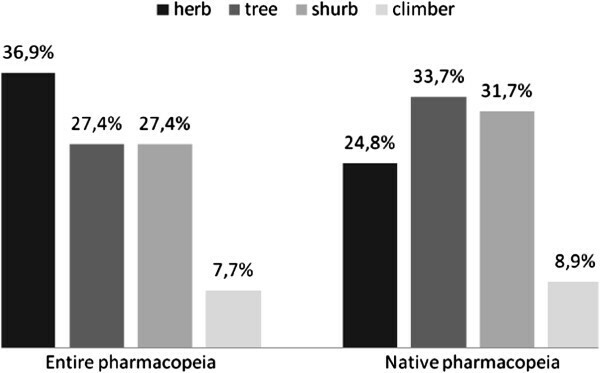 Percentage of ethnospecies per habit in the free lists (entire pharmacopeia) and after removing the exotic ethnospecies (native pharmacopoeia) in Horizonte community, NE Brazil. Although outside of the scope of this study, it is important to mention that the apparency hypothesis has other approximations. Phillips and Gentry  proposed that, from an ecological perspective, apparent (conspicuous) plants are the more abundant ones in the vegetation and therefore subject to be experienced more frequently by human communities, which will lead to a major development of uses for those. Based on this idea, one could suppose that if a plant species is widespread and abundant in a certain environment it is apparent regardless of its habit but this assumption has not yet been tested. A total of 90 ethnospecies were reportedly used during the month preceding the day of the interview (i.e., were recently used). Of these ethnospecies, 11 were from other regions and 79 were collected within the FLONA region; the latter can be divided into the following groups: 37 herbs (46.8%), 21 trees (26.6%), 17 shrubs (21.5%), 3 climbers (3.8%), and one plant of indeterminate habit (one plant not collected). Again, the herbaceous habit was characteristic of most of the ethnospecies. The proportion of herbs increased in the recently used plants while the other habits decreased compared to the percentages of plants per habit in the free lists, suggesting that herbaceous plants were the habit of most practical importance. Supporting these results, among the plants used recently, 40 were non-woody (50.6%) and 38 were woody species (48.1%), increasing the percentage of non-woody plants to the point of surpassing the percentage of woody plants when compared to the values observed in the free lists. These results, obtained via both means of grouping the plants to test the apparency hypothesis, suggest that non-woody plants, specifically those of herbaceous habit, have the most practical value. This finding strongly indicates that these plants, characterized from the biochemical perspective of the apparency hypothesis as having highly bioactive compounds content, are the most desirable for treating diseases within the Horizonte community. The results obtained for the plants used during the month preceding the interviews are influenced by various factors that may skew our interpretation. The period of the year when the interviews were conducted corresponded to the region’s rainy season, concentrated from December to April , a period in which one would expect the herbaceous component of the vegetation to be fully available in the environment, and that may have led to greater use of plants with that habit. These results may also reflect the pattern of diseases experienced by Horizonte inhabitants during this period (e.g., a cold virus spread throughout the population), leading to the use of certain plants. Exotic plants corresponded to 50% (39 ethnospecies) of the medicinal plants used during the month preceding the interview, having a higher representation than in the entire pharmacopeia (38.8%). When the exotic species were removed from the group of plants mentioned as being used within the last month, the percentage of ethnospecies per habit changed, highlighting the following distribution among the native plants used: 14 ethnospecies each corresponded to trees (35.9%) and to herbs (35.9%), followed by 9 shrubs (23%) and two climbers (5.1%). The exotic medicinal flora highlights the herbaceous habit, this time on the practical level because when the exotic plants are removed, trees and herbs formed the highest percentages of ethnospecies richness among those recently used. The results of the informant consensus associating ethnospecies to collection sites are shown in Table 2. In this analysis, the term “other regions” was considered to refer to collection sites that, although not sites in the sense of areas, are still sources of medicines for Horizonte residents; including this term allows for comparisons with this group of plants. The analysis was based on the free lists (FL) and lists of plants recently used (RU). Horizonte community, NE Brazil. The ethnospecies richness cited in the free lists exhibited significant differences depending on the collection sites (X2 16.40; 4 df [degrees of freedom]; p < 0.01), which corresponded to differences between anthropogenic areas and native vegetation (X2 = 10.39; 2 df; p < 0.01), between anthropogenic areas and other regions (X2 = 6.05; 2 df; p < 0.05), and between native vegetation and other regions (X2 = 6.50; 2 df; p < 0.05). The anthropogenic areas differed significantly from other regions in being the site with the highest number of ethnospecies cited and were the principal source (collecting site) of medicinal plants for the Horizonte inhabitants. This result reinforces the findings of other authors that secondary vegetation or the vegetation of anthropogenic areas is the main source of medicinal plants in the pharmacopoeia of human communities in tropical forests [7, 28–30]. Based on the informant consensus, 72.6% (45 ethnospecies) of all the plants, 34.8% (16) of the trees, 50% (23) of the shrubs, and 38.5% (5) of the climbers were strongly associated with collection in anthropogenic areas. When the plants were categorized as woody and non-woody, 70.4% (50) of the non-woody and 40.2% (39) of the woody plants were strongly associated with collection in anthropogenic areas. Additionally, 79.7% (51) of exotic plants were strongly associated with these areas. These results indicate a close relationship between anthropogenic areas and the collection of non-woody medicinal plants, mostly those with an herbaceous habit, as well as of exotic plants. The greater value associated with anthropogenic areas was an expected result from the perspective of the biochemical fundamentals of the apparency hypothesis because anthropogenic areas, in our classification, are open and cultivated areas as well as areas with vegetation in the early stages of plant succession. Therefore, these regions were considered to be areas where non-apparent species dominate, a fact that was corroborated by the high incidence of reports of collection of non-woody herbaceous plants. The greater presence of woody plants, primarily shrubs, in anthropogenic areas certainly helps in differentiating these regions as the main source of medicinal plants and contributes to the higher importance attributed to these areas. Among the woody plants strongly associated with collection in anthropogenic areas, exotic species corresponded to 52.2% of the shrubs and 62.5% of the trees, indicating that the contribution of woody plants to the higher importance of anthropogenic areas as medicinal collection sites was, in more than half of the cases, due to the contribution of exotic plants. Explanations of both an environmental and a cultural nature may contribute to understanding the role of anthropogenic areas and native vegetation in tropical pharmacopoeias. In the Brazilian semi-arid lands within the Caatinga ecosystem, native vegetation zones are the primary source of medicinal plants that are effectively used . This pattern makes sense because in seasonal climates such as that of the Caatinga, where annual rainfall is irregularly distributed throughout the year and ranges between 250 and 1,200 mm, plant use is directed toward the perennial parts of woody plants (bark and roots) that are available throughout the year, in contrast to the herbaceous plants that have limited availability during the dry season . Thus, there is a preference for using medicinal woody plants sought primarily in areas of native vegetation [17, 31]. Explanations of a cultural nature may also contribute to understanding the dominance of herbs and anthropogenic areas in tropical forest pharmacopoeias. For example, in the Brazilian Atlantic Forest, where the annual rainfall is evenly distributed and varies between 1,800 and 2,100 mm, the limited contact that slaves historically had with the region”s primary vegetation (due to their captivity and work in cultivated areas coupled with a high rate of deforestation in this ecosystem) was a factor reported by Voeks  to explain why anthropogenic areas and herbaceous plants are important in the current local pharmacopeia. One must also consider the influence of other cultural archetypes that have been important in forming the local pharmacopoeia over time, of which knowledge and practices are also present in the current local pharmacopeia to varying extents . In this regard, the presence of the dominant European discourse, which attempted to impose its lifestyles on the inhabitants of the “new lands”, is also noteworthy . Many European medicines were incorporated into the African-Brazilian pharmacopoeia, which were either cultivated or found in local secondary vegetation . However, following the line of explanations from the environmental standpoint, it is expected that in Atlantic Forest regions, due to the lack of a dry season , herbs and anthropogenic areas became prominent as the main sources of medicinal plants. The ‘Cerrado’ biome, with annual rainfall between 800 and 2,000 mm and a marked dry period , is intermediate between the Caatinga and Atlantic Forest biomes in terms of annual rainfall. The results obtained regarding the greater prominence of herbaceous plants in terms of ethnospecies richness and practical importance are similar to those found by other authors in tropical rainforests [12, 29]. The native vegetation is primarily a source of medicinal woody flora. Of the 27 native plants that are strongly associated with collection in the native vegetation, 96.1% (25 ethnospecies) are native woody species. Upon separating the native vegetation between outside and inside the FLONA to evaluate the conservation unit’s role as a site for gathering medicinal plants, there were no significant differences in the ethnospecies richness of the plants that were cited as collected at these two sites (G test 5.44; 2 df; p > 0.05). This result indicates that the Horizonte residents find medicinal plants in the native vegetation that can be collected both outside and within the FLONA. The total values in Table 2 indicate the number of ethnospecies with at least one citation for each collection site; these values are expressed in percentages in Figure 2. 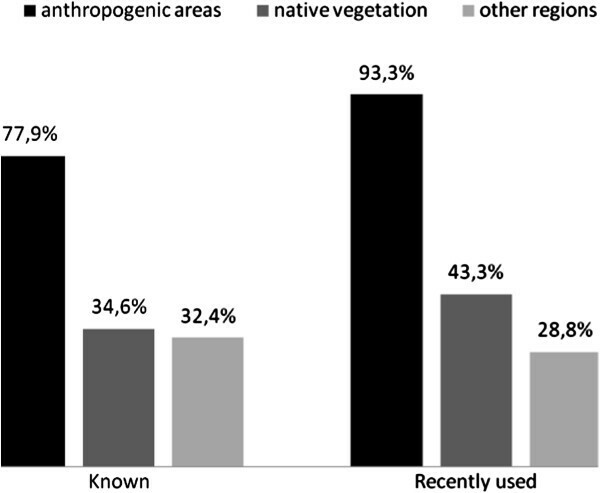 Percentage of ethnospecies with at least one citation for each collection site in the free lists (known) and lists of recently used plants in Horizonte community, NE Brazil. The importance of anthropogenic areas as sites for collecting medicinal plants is even more apparent when analyzing the plants that were recently used (Figure 2). This information about the collection site, although recorded using interviews, corroborates the results obtained by Gavin , who directly recorded the collection sites of plants used in the Peruvian Amazon. He reported more collection of medicinal plants in secondary vegetation that had developed after cultivated land was abandoned than in primary forest. Similar percentages of plants collected in anthropogenic areas (between 74% and 80%) were obtained by Frei et al. in their study with the Mixe and Zapotec indigenous groups in Mexico. The percentage of medicinal plants from other regions was lower in the group of recently used plants compared with the known plants (Figure 2). This finding may be an effect of the accessibility of these resources because the plants from other regions must be purchased commercially (involving monetary costs) or acquired during travel to surrounding Caatinga sites. In contrast, the percentage of native vegetation plants was higher among the plants recently used than for the known plants, indicating that the native vegetation was more important in terms of the practical level or actual use of medicinal plants. Using the information from the free lists, a strong correlation between salience and use value was found (rs = 0.950; p < 0.001), i.e., plants with a high use potential are listed by more people and are ranked higher within the lists, or in other words, people quickly remember plants with a high use potential or versatility. Herbs and trees exhibited no significant differences in use values (H = 0.0111, p > 0.05), and these groups did not differ significantly from shrubs (H = 3.3941 and H = 2.4536, respectively, p > 0.05). Herbs, trees, and shrubs had use values significantly different from that of climbers (H = 7.0096, H = 6.3171, and H = 3.9326, respectively, p < 0.05). Trees had, on average, higher use values (0.205 ± 0.283), followed by herbs (0.201 ± 0.267), shrubs (0.098 ± 0.143), and climbers (0.042 ± 0.054). However, the use value for plants is distributed independently from lignification because the use values for woody plants did not significantly differ from those of non-woody plants (H = 0.5186 p > 0.05). According to the apparency hypothesis based on biochemical fundamentals, non-woody plants and herbs were expected to have higher use values and therefore higher versatility, but the results indicate that medicinal trees, shrubs, and herbs are equally versatile, and woody plants are as versatile as non-woody ones. Among the native medicinal plants used by the rural communities that inhabit Caatinga areas, the trees and shrubs exhibited higher occurrences of quantitative compounds (phenols and tannins) and qualitative compounds (alkaloids, triterpenes, and quinones) . These results partially meet the predictions made based on the biochemical fundamentals of the apparency hypothesis, which may, for example, help explain the versatility of apparent plants in the studied pharmacopoeia. In the same study, Almeida et al. found that medicinal trees and shrubs were the habits with higher relative importance, above herbs, which are similar results to those obtained in the present study, indicating the possibility of a similarity in this respect between the Cerrado and Caatinga pharmacopoeias. Contrasting results were obtained in rainforests such as the Bolivian Amazon, where herbs have, on average, a higher medicinal use value than all the other habits (trees, shrubs, and climbers) . Use value was also not influenced by origin; there were no differences between native and exotic plants (H = 3.2457 p > 0.05), indicating that the Horizonte residents have exploited as many medicinal uses for exotic plants as for native medicinal species. According to the diversification hypothesis, this result may indicate that exotic plants have been included within the pharmacopeia to treat specific diseases because they contain biochemical compounds that do not exist in the local pharmacopoeia or have higher concentrations of those already present . Cultural and biochemical analyses would have to be conducted to delve into the cognitive aspects of the use of exotic plants within this pharmacopoeia. Nine medicinal ethnospecies, all of which were native, were associated with more than 75% affirmative citations for commercial value; of these ethnospecies, 8 were woody (5 trees and 3 shrubs), and one was a non-woody (herb) plant. Again separating the native vegetation outside and within the FLONA, it was found that for five of the ethnospecies, 75% or more of the citations were for collection within the FLONA, three were exclusively from anthropogenic areas (100% of the citations were for this collection site), and one had less than 75% of its citations for any particular collection site (Table 3). ”Fava d”anta’ tree/Dimorphandra gardneriana Tul. *product obtained from any part of the plant. It was expected that non-apparent plants, non-woody plants or plants with an herbaceous habit, characterized by having highly bioactive compounds, would have more ethnospecies with high percentages of affirmative citations for commercial value. However, contrary to expectations, the woody trees had a higher number of commercially important ethnospecies. Of the 12 plant species most commonly sold in the markets in the city of Belem in the Brazilian Amazon, nine are woody natives (six trees, two shrubs, and one climber) and the remaining three are herbaceous exotic plants (extracontinental origin) . In the Caatinga region, medicinal plant use is usually associated with removing the bark from tree species , and the bark from native trees is usually sold in popular markets . These studies indicate that in other ecosystems, trees also constitute the habit of greater economic importance and are mostly native species, such as the trees shown in Table 3. The economic importance of native trees in different ecosystems may be due to cultural factors, such as the perception that naturally growing plants have more healing power , and the biochemical diversity of these plants, as in the case of Caatinga . These factors together with resource availability would lead native trees, dominant in the local vegetation, to be an excellent target for commercialization. Within the group of commercially important plants, five trees and one shrub were strongly associated with collection in the FLONA, the conservation unit having the role of supplying commercially valuable medicinal plants to the Horizonte residents. Relatively high percentages of collection in anthropogenic areas for some of these trees could indicate some type of species management, as in the case of the ’fava d’anta’ tree (Dimorphandra gardneriana Tul.) and ‘pequi’ (Caryocar coriaceum Wittm.) (Table 3), which are species that provide substantial income for the Horizonte residents. The collection of ‘barbatimão’ (Stryphnodendron rotundifolium Mart. ), ‘janaguba’ (Himatanthus drasticus (Mart.) Plumel. ), ‘mangaba’ (Hancornia speciosa), and ‘catuaba’ (Erythroxylum ampliofolium (Mart.) OE Schulz) is prohibited by IBAMA (Instituto Brasileiro do Meio Ambiente e dos Recursos Naturais Renováveis [Brazilian Institute of Environment and Renewable Natural Resources]). Based on the results obtained, one can predict that the collection of these at the commercial level is performed within the FLONA, and thus, these species must be a conservation priority, for which the development of a management plan is recommended. The commercially valuable parts of cassava (Manihot esculenta Crantz) and ‘urucum’ (Bixa orellana L.) (Table 3) are also popularly consumed as food, diffusing their medicinal commercial value. Likewise, the commercial value of the two types of oil from ‘pequi’ is reinforced by their use as food . The ‘fava d’anta’ tree is considered medicinal by the Horizonte residents primarily because the Merck pharmaceutical industry purchases considerable amounts each year to use in medicines . The uhaloa (Waltheria indica L.), also bought by Merck, was cited by only two informants, indicating that this plant has little commercial importance for the community. There was no correlation between the commercial values of the plants and their use values (rs = -0.193, p > 0.05), a correlation that was also non-significant (rs = -0.032, p > 0.05) for the native pharmacopoeia. This correlation, negative in both cases, indicates that there are plants with high use values and few citations for commercial values (see Table 1), suggesting that the economic importance of medicinal plants, regardless of their versatility, can be related to other factors, i.e., the medicinal effectiveness for which the plant is indicated can result in a high commercial demand, or the low incidence of the disease they treat would result in lower commercial demand. Exotic plants have a strong influence on this pharmacopoeia because these plants are determinants of the greater prominence of the herbaceous habit and its practical value as well as the importance of anthropogenic areas. Moreover, the exotic plants are as versatile as native plants in treating diseases. The FLONA has demonstrated its role as a source of commercially valuable medicinal plants for the Horizonte residents. Moreover, conservation units such as the FLONA are considered to play an important role in conserving the local knowledge of native medicinal plants because excluding exotic plants showed that the native pharmacopoeia is mostly woody and from native vegetation sites. The results found here, in agreement with those obtained by other authors, indicate that within a pharmacopeia, there are ecological, biochemical, and cultural variables that interact and determine the use and importance of plants in different cognitive and applied aspects. More studies in different ecosystems that include environmental and cultural variables are necessary to increase our understanding of the behavior of tropical pharmacopoeias in relation to the apparency hypothesis. We thank the Horizonte residents for their willingness to assist and interest in the project, especially Edilma Cordeiro da Silva for her valuable support in the community. We also thank the following researchers from the Laboratory of Applied and Theoretical Ethnobiology (LEA) for their collaboration in multiple activities of the study: Ivanilda Soares, Letícia Zenóbia, Rosemary Sousa, Rafael Domingos, Maria Clara Cavalcanti, Caroline Gomes, Lucilene Lima, Thiago Araújo, Ribamar Junior, Gilney Charll, Alyson Almeida, Rafael Silva, Washington Soares, Patrícia Muniz, Taline Silva, and Mariana Giraldi, and all the others who gave their support in some way. Thanks to Luisa Casas for her help in the field and for reviewing the document. We thank the staff of the herbarium at the Regional University of Cariri (Universidade Regional do Cariri - URCA), Crato Ceará, especially Dr. Maria Arlene Pessoa da Silva, the herbarium director and M.Sc. Ana Cleide Alcântara Morais for her availability and work in identifying the samples. We thank the ICMbio (Instituto Chico Mendes de Conservação da Biodiversidade [‘Chico Mendes’ Institute for Biodiversity Conservation]) for permission to study the site and CAPES (Coordenação de Aperfeiçoamento de Pessoal de Nível Superior [Coordination for the Improvement of Higher Education Personnel]) for financial support to AL. This paper is contribution P013 of the Rede de Investigação em Biodiversidade e Saberes Locais (REBISA-Network of Research in Biodiversity and Local Knowledge), with financial support from FACEPE (Foundation for Support of Science and Technology) to the project Núcleo de Pesquisa em Ecologia, conservação e Potencial de Uso de Recursos Biológicos no Semiárido do Nordeste do Brasil (Center for Research in Ecology, Conservation and Potential Use of Biological Resources in the Semi-Arid Region of Northeastern Brazil-APQ-1264-2.05/10). Also, we thank the anonymous reviewers for their constructive comments, which helped us to improve the manuscript. AL was the main author responsible for conducting the study, obtaining and analyzing data, and writing the manuscript. Collection of the plant specimens was also carried out by AL, and UPA assisted with identifications. UPA, MFTM and ELA contributed to the design of the study, interpretation of the findings and preparation of the manuscript. All authors read and approved the final manuscript.